Bus from Johor Bahru to Pekan is the most convenient mode of transport to travel from Southern region largest city to Pekan. With the lack of direct flight and train services, bus service becomes the only transportation option for the local to travel from Johor Bahru to Pekan. 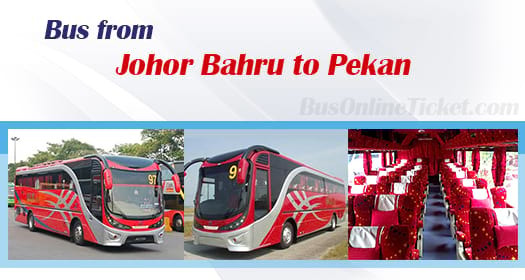 Maju Express is the one and only bus operator offering bus service from Johor Bahru to Pekan. Maju Express is a popular bus operator provides comprehensive bus service throughout Malaysia, especially bus departs from Johor Bahru to East Coastal Peninsular Malaysia. Maju Express provides up to 4 daily departures from Johor Bahru to Pekan. The first bus starts as early as morning 10:00am and the last bus is at night 11:30pm. In between, there are afternoon 3:30pm and evening 9:30pm bus service to serve passengers to Pekan from Johor Bahru. Duration from Johor Bahru to Pekan takes on average 4.5 hours by bus depending on the road traffic condition on the day itself. Please note that all buses in Malaysia have no toilet on board, Therefore, at least one washroom break will be given during the journey. The bus fare for bus from Johor Bahru to Pekan is reasonably priced at RM 25.70 for adult and RM 19.40 for child. Bus departs from Johor Bahru will pick up all the passengers at Larkin Sentral Bus Terminal, the largest transport terminal in Johor. Upon arriving Pekan, the bus driver will drop off all the passengers at Pekan Bus Terminal. Due to limited schedule and seats available for bus from Johor Bahru to Pekan, making bus ticket booking online in advance is strongly encouraged. You can simply book your bus ticket online via the most reliable ticketing portal BusOnlineTicket.com to secure your seats before travelling. All bookings made through BusOnlineTicket.com are instantly confirmed.